No matter how long you've gardened, or how good your record keeping is, there comes a time when you look at a plant and ask yourself, "Did I plant that?" It looks like I might have. There's a little piece of last years dried up growth still clinging to the base. That could just mean it probably was there last year, but it still could be a weed I just didn't get around to pulling. It looks sort of like a weed. Jimson weed? Hmmm... doesn't seem quite like Jimson weed. 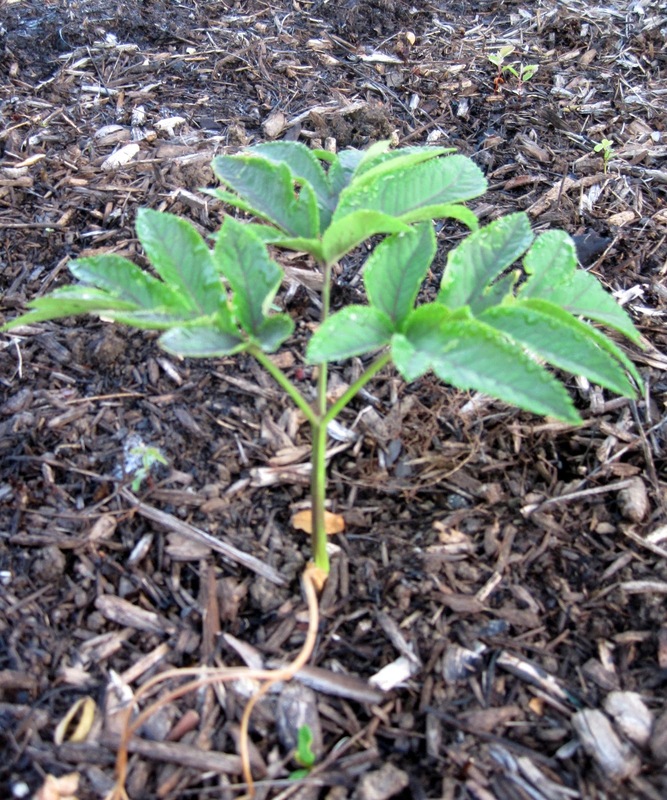 Walnut tree seedling? No, I've got those in other parts of the garden and they look different. Though, heaven knows, or actually the squirrels know where there are walnut trees around here. I guess the woods behind the houses across the street include walnut trees. The squirrels like to bring walnuts over to my garden and either bury them or throw them on the driveway to crack them open. Do I let it grow a little more and see if it starts to look like some plant I want to keep? There's just one of whatever it is, how much harm could it cause? There's a lot to do in the garden this time of year, so I think I'll just let it grow a little more and see what happens. Maybe some nice reader will come along and identify it for me? In the meantime, I do know what this plant is. 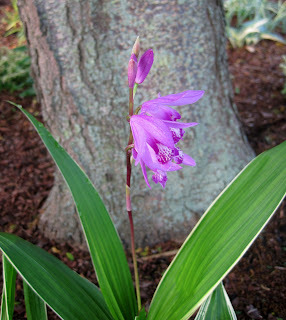 Hardy ground orchid, Bletilla striata. I definitely planted it, and several more like it. I'm working on getting it to naturalize around this locust tree. Update a few hours later: Thanks to Mr. McGregor's Daughter, I remembered that my mysterious plant is Angelica giga. I bought it about three weeks ago. Wonder where the tag is? Wonder where my memory is? I am sorry I can't identify it for you, but that is what I call a wait-and-see plant, as in, "I don't know what that plant is, so I'm going to wait and see if I can figure out what it is before I pull it." When you live in a garden that has had several owners, as I do, you can get some nice surprises that way. Sadly, "Did I plant that?" is a phrase regularly heard in my garden. I have a couple right now that I'm eyeing to see if anything dawns on me. It kinda sorta looks like a cleome seedling, but I'm probably dead wrong..... ~sitting back to wait and see what it turns out to be. 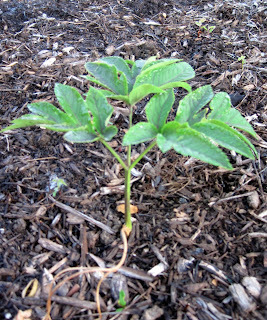 then there's the opposite: I know I planted it, but where exactly, and is that unfamiliar seedling the seed I planted? I've pulled out more than a couple seedlings that way, thinking they were plants. I don't recognize it either...and I am wishing I had a ap/online program that helped me easily identify seedlings! Ha Ha! Went out to check my poppies this morning, because they're all about to bloom. I thought I planted red poppies, but the first open bloom is purple! I have no idea what I planted! Ah, but that's the fun of gardening--there are so many surprises! I've become a much more organized record keeper in the past few years, but the early years of this home's gardens were a hodgepodge of planting whatever struck my fancy at the nursery...and I still look at certain plants every spring and wonder--friend or foe? 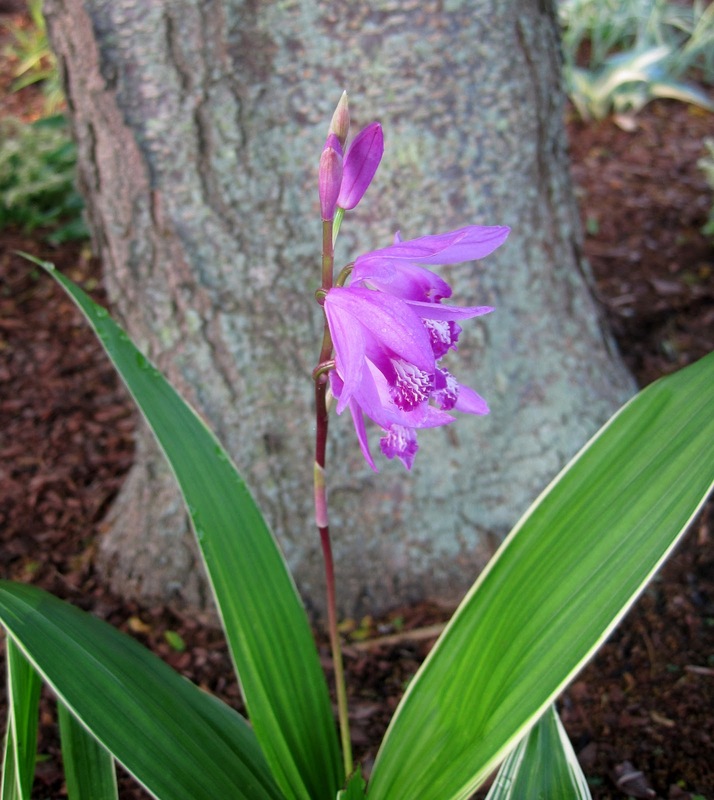 ;-) I am absolutely coveting your ground orchid--stunning! We call it 7 leafed plant (in Bulgaria). The leafs are divided into 7. Seven is magic number and some people think that plant is magic. When I search in Google with this word in Bulgarian in Latin appears Aegopodium podagraria. I have nursed along and even fertilized many a weed before having a really long look…and then yanking it out!! You are not alone. Don't you just hate it when this happens? At least you didn't pull it out and then find out you wanted it. Thanks for link love. I also had to ask when my Angelica gigas sprouted. It is kind of scary looking until you learn it's something you want. The little orchid is very sweet. It's so nice to know I'm not the only one with this problem! I think all of us gardeners are like that. What is worse is when i know exactly what it is that i've grown including the stories behind it, but i can't say the name from memory gaps! Bloggers have once and again helped me identify my new plants or those I've just seen growing in the property from nowhere. That orchid is lo lovely specially with the white at the edges! Boriana got it right. Bishops' weed, goutweed...a real problem here in my new z5 garden. Kill it now while you still have half a chance. All the time! Funny story. Interesting looking plant. I had to Google this one. Love the flowering heads. Hahaha! I had one of those wait and see plants this spring, too. Turns out it was a volunteer tomato. Good thing I didn't pull it out!